Time for some road fun on your bike, lets grab a bottle of water, load up the gears, mount your LED light and don’t forget the iPod or any other MP3 player you have. 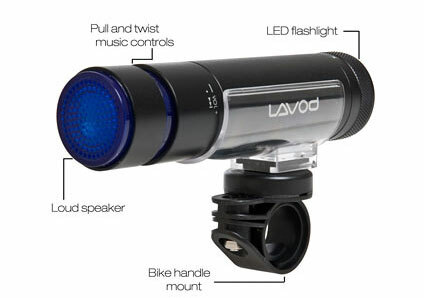 Or you can keep the Lavod MP3 bike speaker which also has an LED flash light attached to it. If you happen to listen to music more than often specially when riding a bike then you definitely need to look at this cool little gadget. It is an MP3 bike speaker which has plenty pf space for strong hundreds of your favorites songs. This bike speaker can store up to 1000 songs on its 2GB internal memory. It can play songs in both mp3 as well as wma format. This mp3 bike speaker has an integrated of 2.3 Watts which is sufficient enough when this mp3 bike player is attached to the handlebar. The lavod MP3 Bike speaker has an internal battery which gets charged via USB. When completely charged, it can play music for as long as 10 hours and thats a lot of riding. The bike speaker also has an optional earphone jack. Another new and interesting option in this speaker is its mode selection control ring which is an all purpose control of this Lavod MP3 bike speaker. It lets you select song, alter volume etc. The MP3 bike speaker has a built-in LED flash light at the front end which lets you brighten up those misty paths and dark evenings specially during the winter season when we have shorter days. Not surprisingly this gadget is splash proof and comes with all the necessary mounting gears so you do not need to spend extra on mounting accessories. The MP3 Bike speaker simply slides into the mounting bracket so installation is a snap and in the same fashion it slides out of the bracket for easy charging. The gadget itself is 14cm long and 3.4cm in diameter. When you purchase this Lavod Bike MP3 speaker you will also receive protective rubber cap, bicycle mounting kit, USB charging cable and a user manual. Overall we think this is a very handy gadget to have specially for those who can not live without riding and listening to music at the same time. We rate it 7/10 because we think that 10 hours play back time is a lot fo time for a bike mp3 speaker + flash light.